For designer Emily Castle, developing a relationship of trust with her clients in paramount. 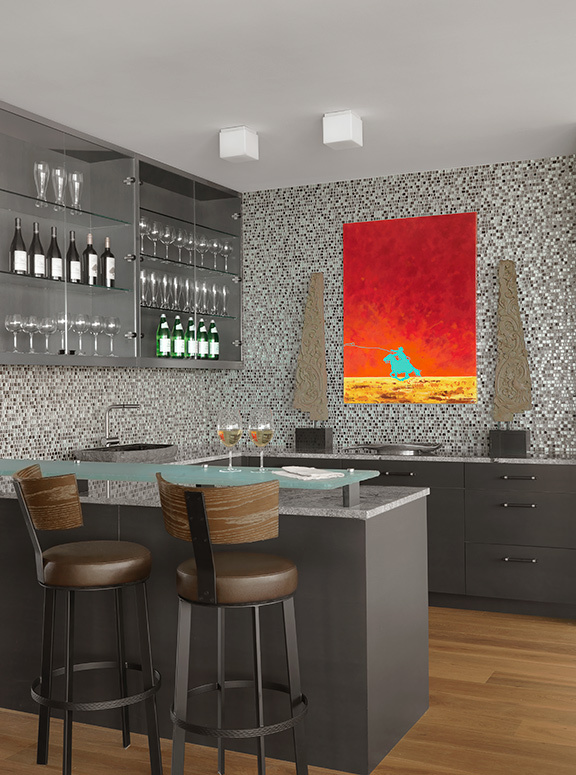 Spanned by a 9-foot custom range hood, the kitchen’s rare Arabescato Orobica marble backsplash established the basic color scheme for this stunning urban penthouse. 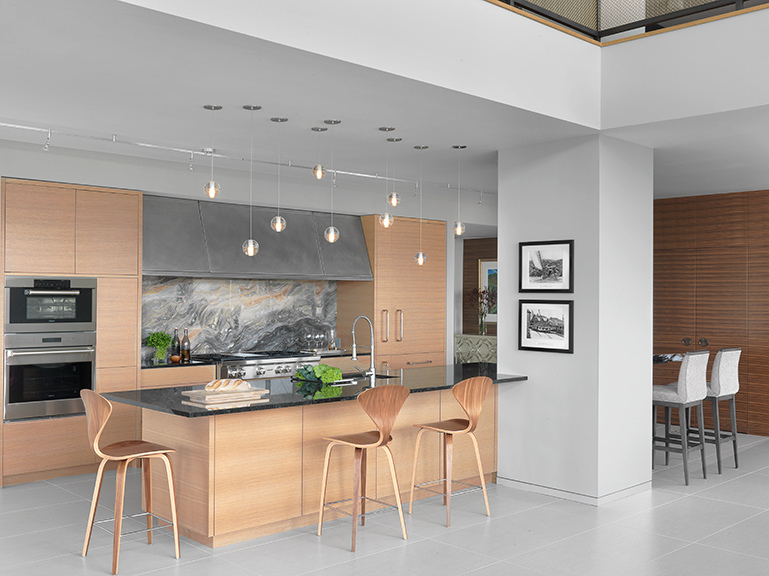 Curvilinear shapes, organic materials, and native and reclaimed woods – for example, the kitchen’s quarter-sawn white oak cabinetry – were used to soften the architecture’s stark contemporary design. With views that stretch for miles, the 2-story great room is a masterful blend of the clients’ transitional tastes and the modern architectural styling. A spectacular DaSomm Choi-designed lighting fixture, handmade rug in an abstract pattern resembling fallen leaves, and greenery link the interior space with the magnificent surrounding landscape. 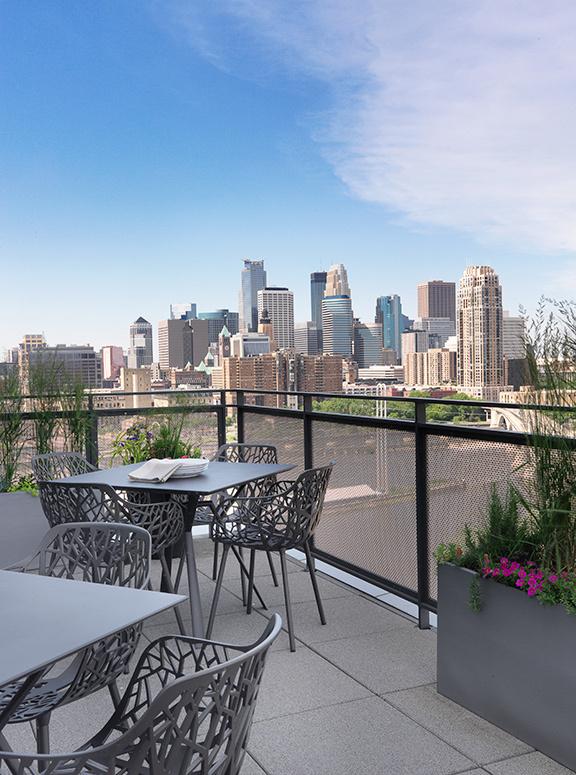 Ideal for fresh-air entertaining, the expansive terrace offers dramatic views of the Minneapolis skyline. Visible from the kitchen, the peninsula fireplace repeats the Arabescato Orobica marble and defines the formal dining area. Suspended above the couple’s previously owned dining ensemble is a multi-layered John Pomp chandelier. 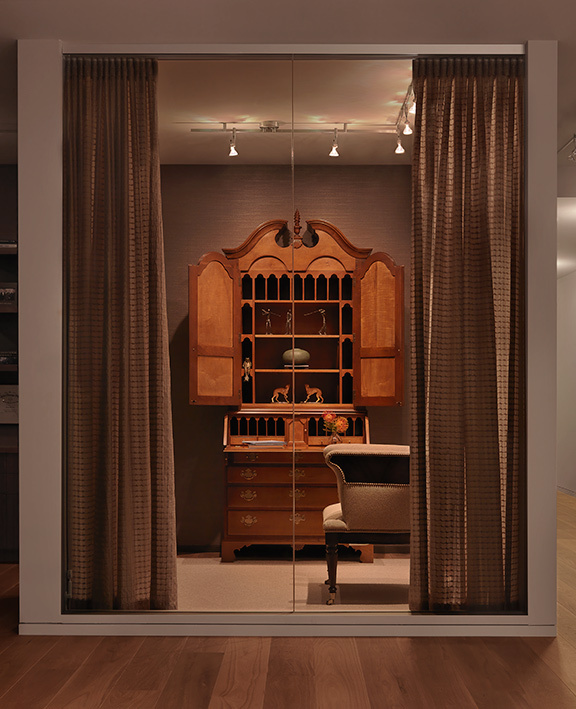 A discreet pocket door provides access to the husband’s unique phone/conference room, elegantly furnished with an antique secretary and mahogany Grant Chair by Alexa Hampton. Floor-to-ceiling glass admits natural light, and custom drapery allows for complete privacy, when desired. Installed on a platform and equipped with a ceiling-mounted tub filler, the gracefully contoured soaking tub resolved the plumbing challenges and became the focal point of the master bath. 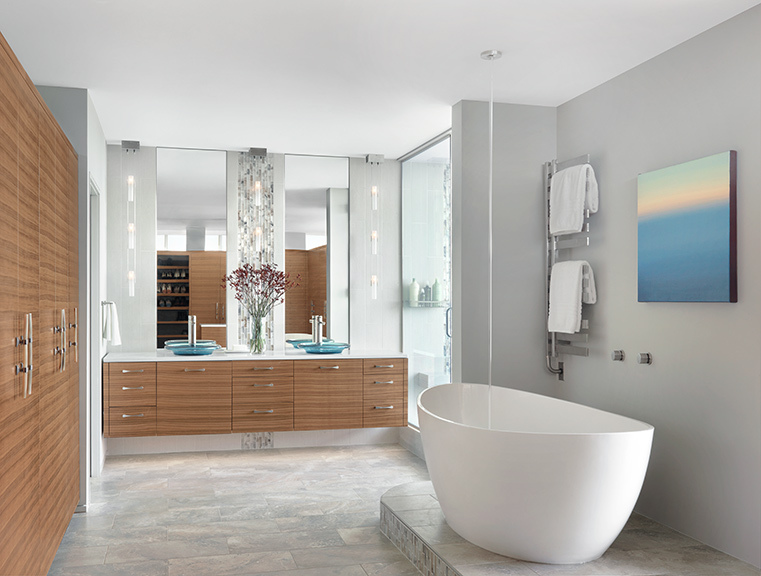 Quarter-sawn walnut cabinetry with pale horn handles adds warmth to this relaxing oasis. Spatial planning was crucial in master suite, and Castle designed a free-standing walnut wall to separate and conceal the master closet and bath from the serene, Asian-inspired bedroom. 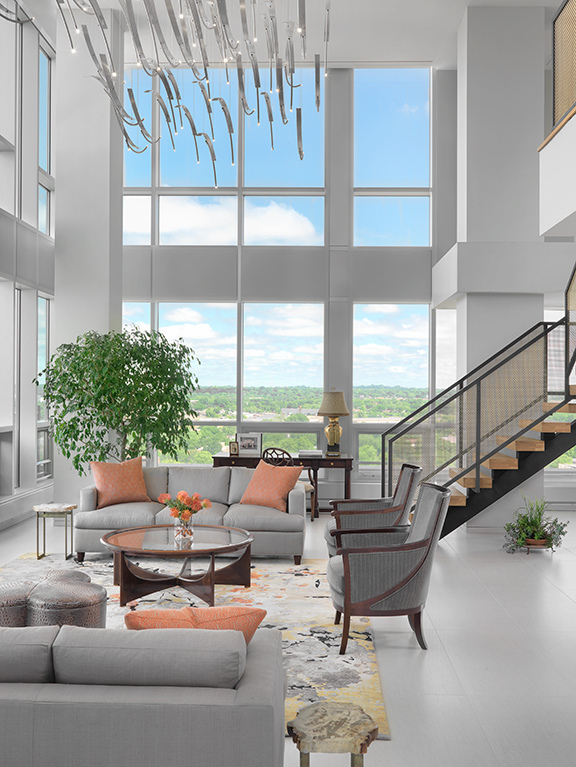 Seventeen stories above street level, this spectacular penthouse offers panoramic views of the city’s skyline, Mississippi River and the historic Saint Anthony Falls. Wait a minute…Where are we? Well, in Minneapolis, but the links with St. Louis will soon become apparent. Longtime residents of Minnesota, the owners of this magnificent residence are both doctors – the wife an anesthesiologist, the husband formerly a cardiologist and now a serial medical device inventor and entrepreneur. For several years, the husband worked temporarily in St. Louis, living in a Central West End condominium and commuting to their suburban Minneapolis home on weekends. Fast forward to 2015, when the couple decided to make a lifestyle transition. Lured by downtown Minneapolis’ natural beauty and vibrant cultural, dining, sports and entertainment venues, they were ready to leave the suburbs and embrace urban living. Surrounded by glass, the penthouse they found was in a newly renovated high-rise building located within easy walking distance of the city’s highlights. The voluminous two-story space was essentially “just a big white box,” however, and the couple was unwilling to make a purchase decision until Castle had seen it. “We wanted to be sure that Emily could recreate the same effect she’d achieved for us in St. Louis,” the wife explains. Traveling north, Castle evaluated the possibilities and announced to her clients, “Let’s go for it.” She worked alongside a team of local architects, construction professionals and lighting designers to transform the starkly modern steel-and-glass “box” into a warm, inviting environment, consistent with her clients’ transitional tastes and the large-scale philanthropic events they frequently host. Castle’s first challenge was to determine the spatial layout and flow pattern. On the main level, a large structural column serves to define the vast two-story great room from the more intimate one-story spaces, including the formal dining room and kitchen. Another structural support within the kitchen space presented a problem, though, and the designer cleverly used this column to separate the main kitchen from a cozy breakfast area – without obstructing the fabulous views. Lined with two-toned gold/silver mesh, the floating staircase is literally an art piece and visually integrates the great room with the expansive outdoor terrace. On the upper level are a media area and fully equipped bar, loft-style office, unique glass-enclosed phone “booth” for the husband’s private conference calls and tranquil secondary bedrooms. 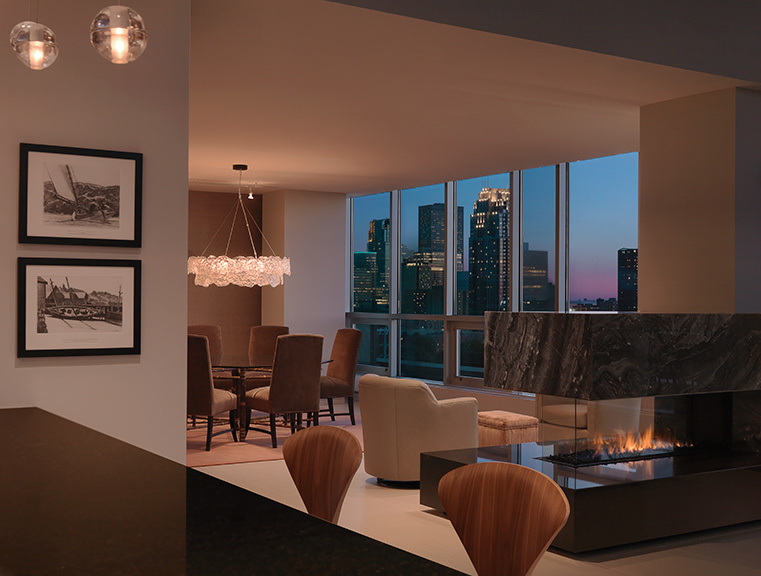 The penthouse’s awe-inspiring landscape views provided inspiration for Castle’s interior design, which emphasizes organic elements – reclaimed native woods, marble and stone, various metals and a sophisticated color palette drawn from the rare Italian Arabescato Orobica marble chosen for the kitchen backsplash and dining-room fireplace façade. The preeminent showpiece is the great room’s immense lighting fixture, designed by DaSomm Choi for Yellow Goat Design. Consisting of 32 arched aluminum bars with LED pin lights, this dramatic creation mimics the tumbling waters of Saint Anthony Falls below. Another reminder of nature in this soaring space is the custom wool and silk rug, handmade in India with an abstract pattern that resembles fallen leaves. To further offset the architecture’s strong verticals and horizontals, Castle used a variety of furnishings with curvilinear shapes. A few random examples include molded chairs surrounding the kitchen island, curved chair backs in the breakfast area and upstairs bar, the master bath’s ovoid soaking tub and, in the great room, a circular Baker coffee table, tripartite circular leather ottoman from the owners’ previous home, and softly cushioned seating. Encased in Arabescato Orobica marble, the three-sided peninsula fireplace is visible from both the kitchen/breakfast area and the dining room, where the couple’s pre-owned dining ensemble is topped by a circular, multi-layered John Pomp chandelier. Custom-designed to span the kitchen’s matching marble backsplash, a nine-foot matte-finished steel hood tops the six-burner Wolf range and two prep stations — all complemented by custom-glazed rift-cut white oak cabinetry and charcoal granite countertops. Plumbing was a particular obstacle throughout the design and construction process. Typical of high-rise buildings, plumbing was inaccessible through the floors, but Castle resolved the issue with a variety of innovative solutions. In the master bath, she turned the elegantly contoured soaking tub into a focal point by mounting it on a platform and installing a ceiling-mounted tub filler. In the powder room, a custom floating vanity allowed for wall-accessible plumbing, with a hand-cast white bronze sink adding an artistic touch. Asian-inspired, the master suite is a peaceful haven, with the custom bed set against a freestanding, wood-plank wall that separates the bedroom from the wardrobes and sumptuous open bath, accented with pale blue glass wall tiles and vessel sinks. 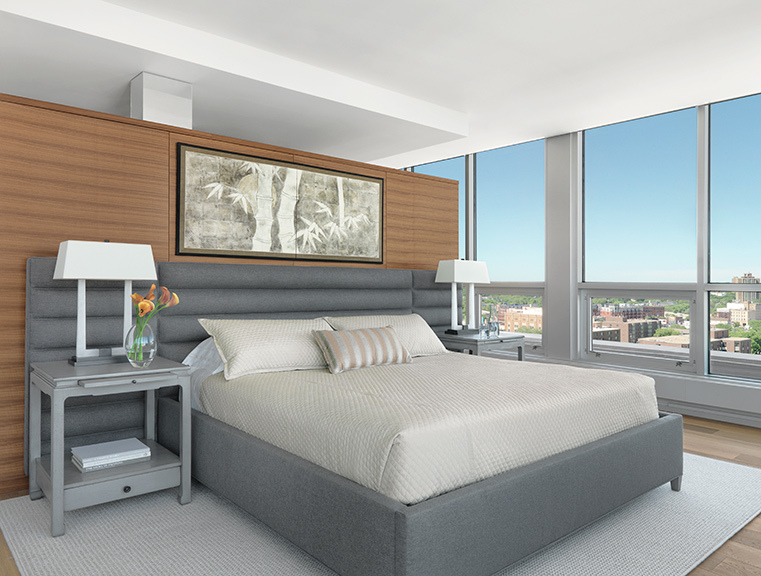 Although not much of an issue at this height, privacy is afforded by motorized window shades throughout the penthouse, providing solar protection and preserving the extraordinary views. As evidenced by this residential masterpiece, St. Louis can be proud of its top-notch design professionals, and Emily Castle certainly ranks among them. Beyond her sheer artistry, Castle’s technical skills prompted the owner to add, “Emily is a marvelous contractor. She kept things moving forward and on time.” And from a featureless white “box,” the award-winning designer has created a breathtaking urban oasis, perfectly suited to her clients’ lifestyle. The real key to Castle’s success, however, lies in her firm’s design philosophy. “It’s all about relationship,” she maintains. “We see our clients as partners – listening carefully to them, evaluating their needs and personal style, and gaining their trust.” And once that relationship is established, it’s likely to endure for years to come… wherever and however her clients choose to live.